Catastrophe bond and insurance-linked securities (ILS) premium rates can now be considered to be in a hard market, making now a good time to invest in the asset class, according to analysis from ILS focused consultancy Lane Financial LLC. In fact, premium rates for ILS and catastrophe bonds may now be at their best since as long ago as 2012/2013, according to the consultancies data, after the catastrophe events of 2018 and loss creep continuing from 2017 drove price expectations higher. This naturally flows through into collateralized reinsurance, retrocession products, sidecar premiums and instruments such as industry loss warranties (ILW’s), which as we explained on Monday have seen recent indicative price rises. 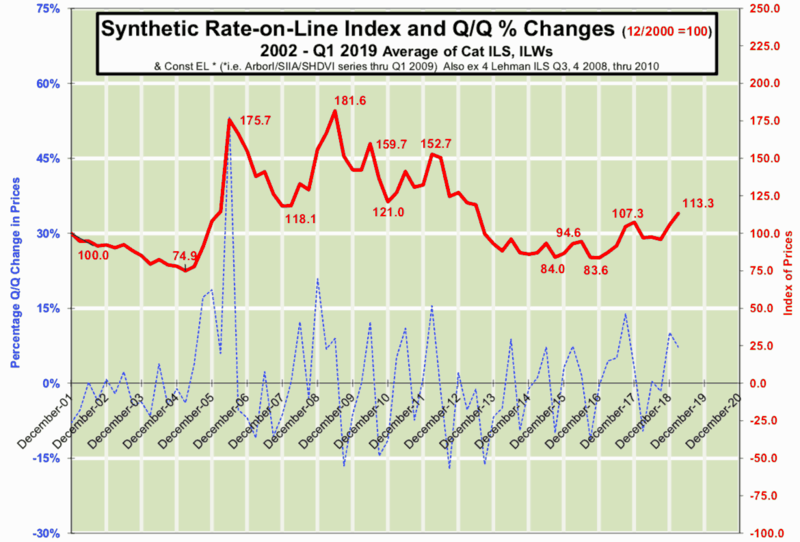 In fact, just since the end of 2018 the synthetic ILS rate-on-line index has added more than 2.5%. The chart below displays Lane Financial’s synthetic ILS rate-on-line index, clearly showing rates back at levels last seen in 2012/13. It is particularly interesting to see that ILS and catastrophe bond rates-on-line have actually been on the rise since late 2016 or early 2017, suggesting that the market had decided higher rates were required (or that rate softening had gone far enough) perhaps slightly in advance of the major hurricanes of 2017. On the reinsurance side, Lane Financial notes that while expected returns of catastrophe reinsurers are likely up, they are not as high as they had been back in 2011, but still better than they were in 2016. Again, this bodes well for the upcoming reinsurance renewals, where reinsurers will hold significant sway in supporting rate increases, which the ILS market seems clearly keen to achieve, as evidenced by the hardening of the catastrophe bond market. Lane Financial also note that expected returns have risen for the ILS asset class thanks to the U.S. Fed’s raising of interest rates, as with ILS floating above this, due to the use of Fed treasuries as collateral, the prospects for ILS investors right now may be as good as they’ve been for quite some years. In fact, Lane Financial take a floating rate of 2.46% return for the first quarter of 2019, which if combined with a market-weighted portfolio of ILS securities provides a running loss-free total return of 7.89% and an expected total return of 5.59%, the research says. 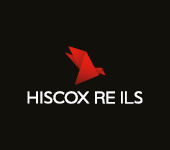 That is a particularly attractive opportunity for investors then, as this additional floating return can boost ILS and cat bonds at a time when the premium rate has also been seen to harden. There could be room for even more improvement in ILS returns as well, as “The hard market is here but may yet intensify further,” Lane Financial says. If losses are greater than expectation again in 2019 Lane Financial expects that ILS premium rates will rise even further. Another reason to enter the market at this time is that secondary prices for catastrophe bonds tend to trend a little lower in advance of the U.S. wind season, something that has been evident in recent weeks with many bonds pricing below par. As a result, “Entry or re-entry into the ILS market now seems appropriate,” Lane Financial recommends. Fund manager sources confirm that investor interest in catastrophe bond investment strategies remains relatively strong in 2019, with some inflows seen, although levels are as ever restricted by just how much market issuance is available. Lane Financial’s analysis suggests that investor interest in cat bonds may continue to rise throughout this year, which could help to drive more issuance in the long-run as sponsors experienced and new look to capitalise on the appetite from the capital markets for more securitized reinsurance risk. 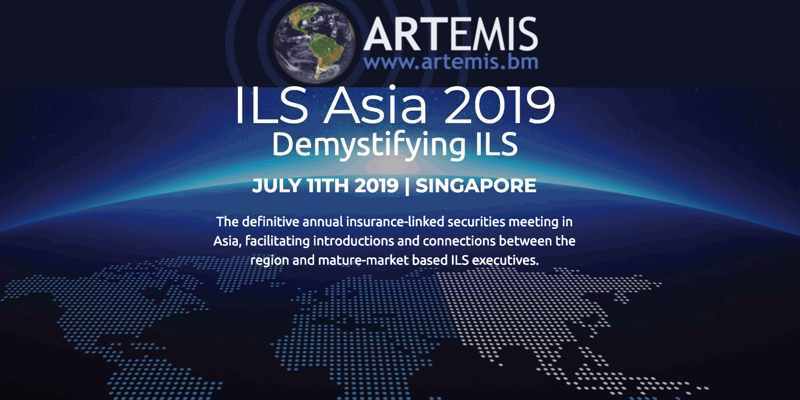 You can hear from Morton Lane, President, Lane Financial LLC, at our upcoming Singapore ILS conference on July 11th 2019.